The Group’s headquarters in Singapore is located at Tanjong Pagar Centre, the city’s tallest building located in the Central Business District. Rising directly above the Tanjong Pagar MRT Station, the iconic landmark is an integrated development comprising a dynamic mix of commercial, residential, retail, hotel and urban park components. 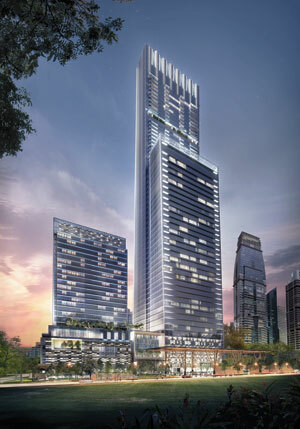 The Group’s first integrated mixed-use project in Singapore is anchored by a soaring tower with floor space totalling 1.7 million square feet, comprising Guoco Tower, a 38-storey Grade A office block, six levels of premium retail and F&B space, 181 prestigious residential homes and a luxury business hotel. Located above the Tanjong Pagar MRT station, the iconic development stands at 290 metres, defining it as the tallest building in Singapore. This global icon aims to position Tanjong Pagar as a premier quality business and lifestyle district in the CBD and be a benchmark for sustainable and liveable developments which will be differentiated by the richness of the historical district, park and landscape spaces. It is designed by internationally-acclaimed architectural firm Skidmore, Owings & Merrill (“SOM”), whose impressive portfolio of works include the world’s tallest buildings such as Burj Khalifa in Dubai and the upcoming One World Trade Center in New York.